Caleb Couturie of FishDuck.com was at PK park yesterday afternoon to catch up with Shaun Chase and the rest of the Oregon Baseball team. Coming off his best season at Oregon, Shaun Chase, the Duck senior catcher, was named a pre-season All-American after leading the Pac-12 with 14 homers. 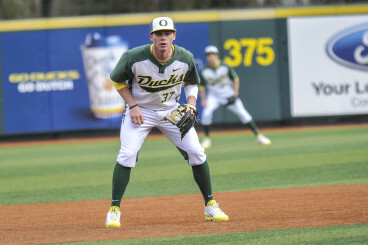 Chase also saw jumps in batting average and RBI, batting .283 with 37 RBI.With his power surge last season everyone wants to know if he is going to continue to flex his muscle or change his approach with the strong offense Oregon is ready to put on the field. “If it happens it happens,” Chase said of trying to lead the Pac-12 in homers again. 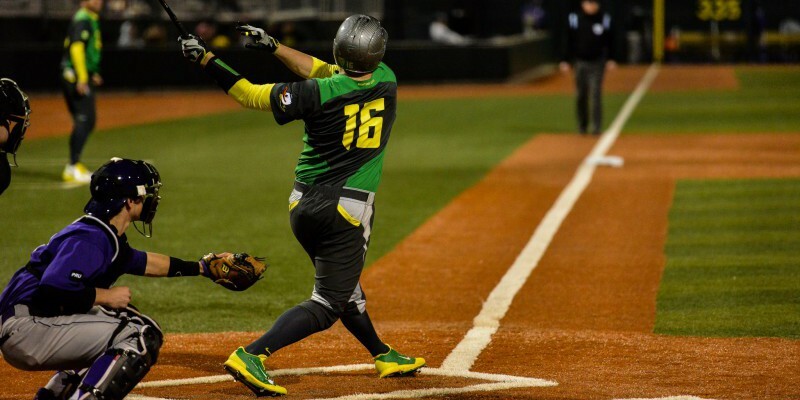 “I just want to drive the ball [and] produce a lot of RBIs.” With the talent the Ducks have, including junior Mitchell Tolman who has hit .315 the past two seasons, Chase should enjoy plenty of help meeting that goal. While Chase may be the senior coming off an excellent season, he has some competition at catcher “it’s going to be a battle all year for positions,” he said. “No positions are on lock.” Chase noted how deep this roster is and how that will help them over the long season. A little competition should keep the no. 15 Ducks sharp in a very tough Pac-12 with Stanford (18), Arizona State (19) and the ever lurking Oregon State Beavers, who despite having the No. 1 seed in last year’s playoffs did not make the pre-season top 40. The Ducks open their season February 13th in Hawaii where Chase always enjoys playing. “My Grandma lives there,” he told us. “My whole family goes so it’s always a good time.” The Ducks might start their season in paradise but they are focused on the big picture. “The approach is still the same. We want to win a National Championship. We want to win the Pac” Cole Irvin explained. If Chase and Tolman can improve on their 2014 performances and Irvin makes a successful recovery from Tommy John surgery, then the Ducks will be in line for a fourth straight 40 win season and a shot at a national title.